but guaranteed smooth chocolaty decadence. no need to slave over a messy chocolate bowl with latex gloves and rolling into perfect little balls. i've made so many little truffle balls in the past year or two that i've lost count. it's the rolling, the mess and the clean up i don't look forward to...so i decided to pour the mixture in a flat pan, cut them into squares, dip them in cocoa and call it a day. RAS el HANOUT...a Moroccan spice blend usually containing coriander, cumin, cardamom, fennel, cinnamon, all spice, turmeric, paprika and black pepper. it does vary a little bit from region to region, spice vendor to vendor. i found my Ras el Hanout at Mother's Market. if you can not find a Ras el Hanout blend, try the spice shop called "Savory" or you can make it yourself. this recipe from Wiki-how(link) is similar to the one i have. 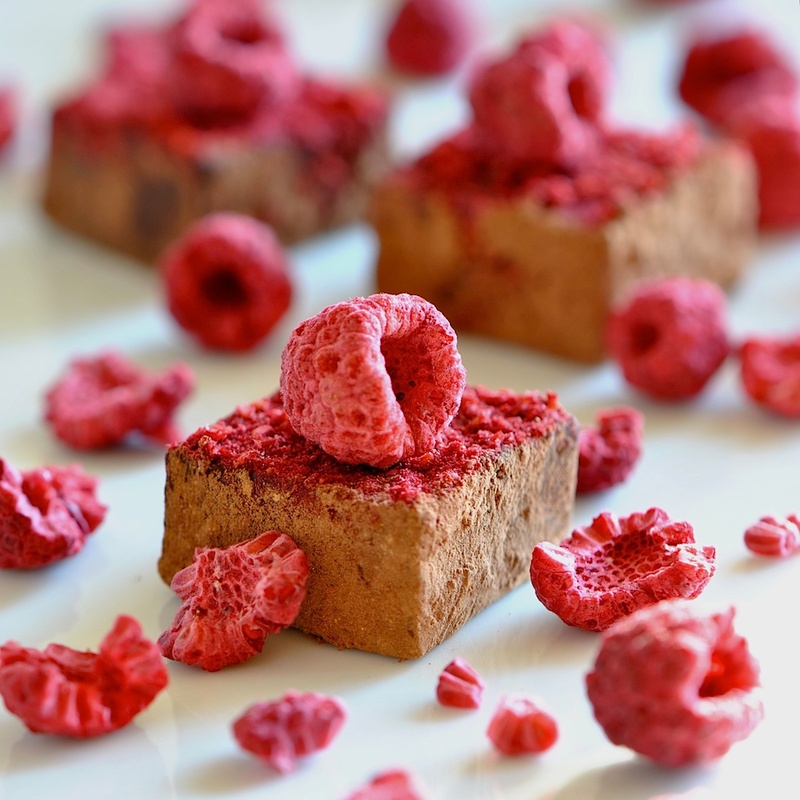 ROYAL RASPBERRY ?...an extract i have found very useful at Surfas. it read on the bottle "for chocolate" so i snatched it up. it's much better than your regular store bought raspberry flavoring. i make small batches. just enough for all my pals to get 1 or two. this small recipe is just enough for about 24 nice bite size squares. 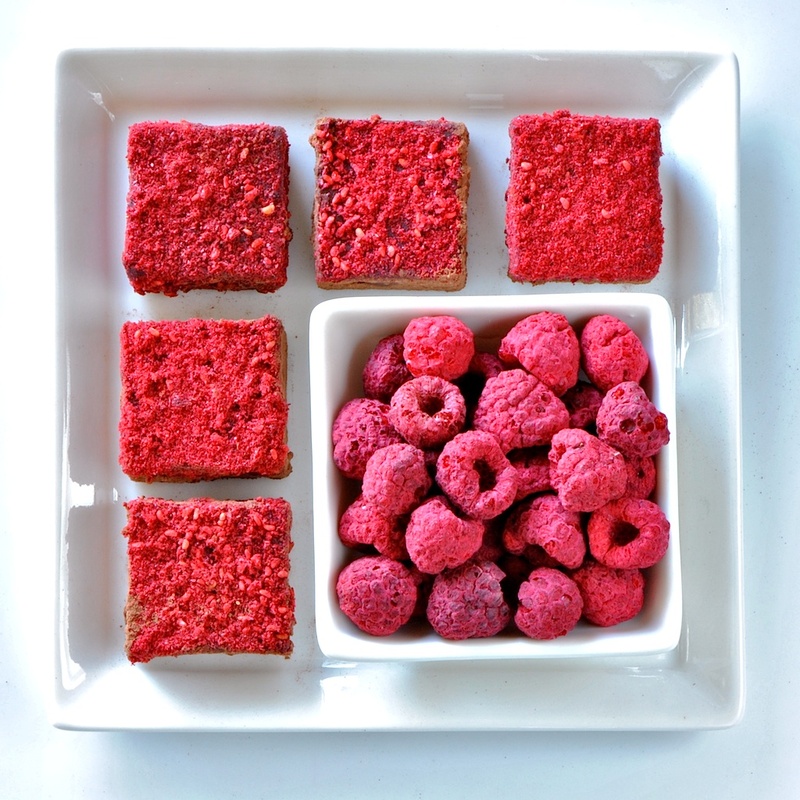 1/2 tsp, plus a few drops of "royal raspberry extract"
prepare a small square/rectangle dish or tupperware. use something with a flat bottom. mine is 8 x 5 inches. lightly spray the inside, then line it with heavy saran or just use regular tinfoil. make sure you have over-hang for easy removal. 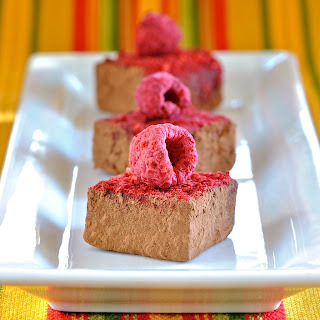 chop chocolate in very small pieces...set aside in glass bowl. NOTE...i put an extra tablespoon of milk in due to the straining. heat the milk to just a boil. strain directly into and over chocolate. let sit for a moment. i wrap a kitchen towel around the bowl to keep the chocolate mixture cozy when gently stirring the ganache. start stirring from the middle. the ganache will start to come together. when the ganache looks nice and glossy and there are no visible lumps you can get the hand whisk out. lately i have found that after everything is smooth and creamy a good hand whisking is in order to fully emulsify the fats...see notes below. when you are satisfied with the consistency, pour into prepared dish. tap on the counter a few times to even it out. refrigerate until completely set. should only take about 30-40 minutes. remove by lifting out in one piece holding the saran. 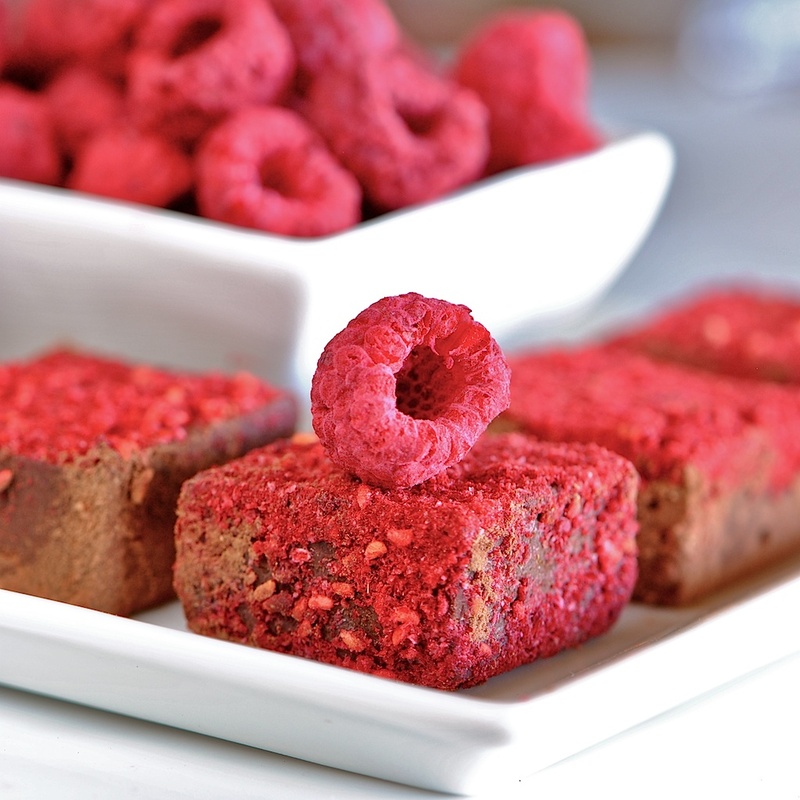 cut into squares and coat in powdered raspberries and cocoa. if you store them in the fridge they will darken as shown, but can handle room temp for a day or so, covered. NOTE...quite often my coconut milk ganache seems to "break"...this means it is not absolutely glossy after it is combined and will result in a grainy truffle texture...you DO NOT want this. i can now recognise it right away. if this happens keep whisking to emulsify until glossy. if you don't notice it until after it has set, don't worry...just cut block into small squares and reheat over a double boiler...then whisk until fully emulsified. and pour into another prepared dish. 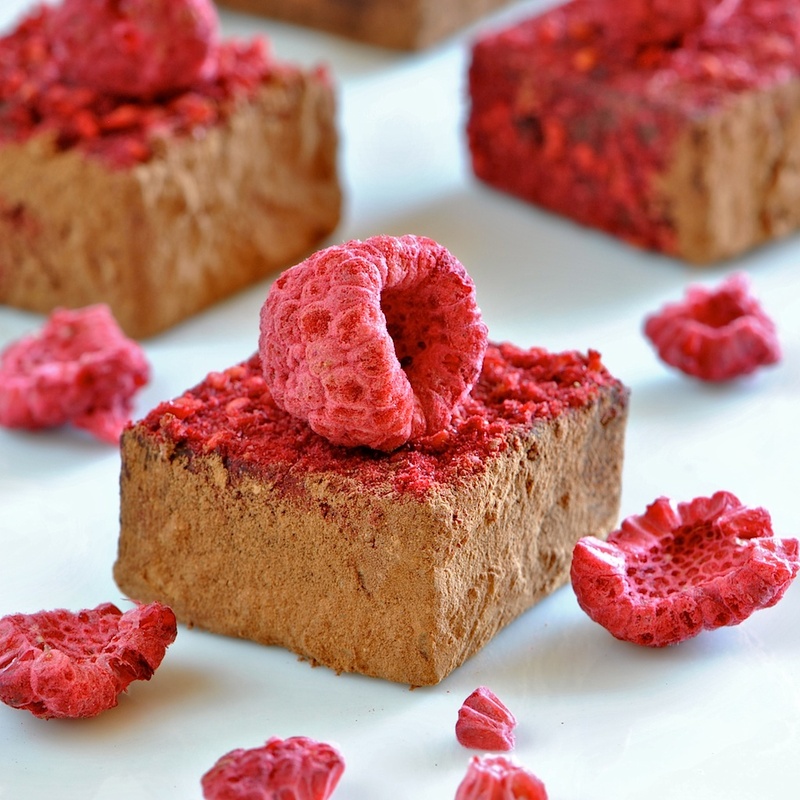 0 Response to "Royal Raspberry Ras el Hanout Truffles"